With the hot weather, we’re seeing all too many overheated dogs at the moment. Tragically, heat stroke is often fatal to dogs, and they are much more sensitive to the effects of heatwaves than we are. 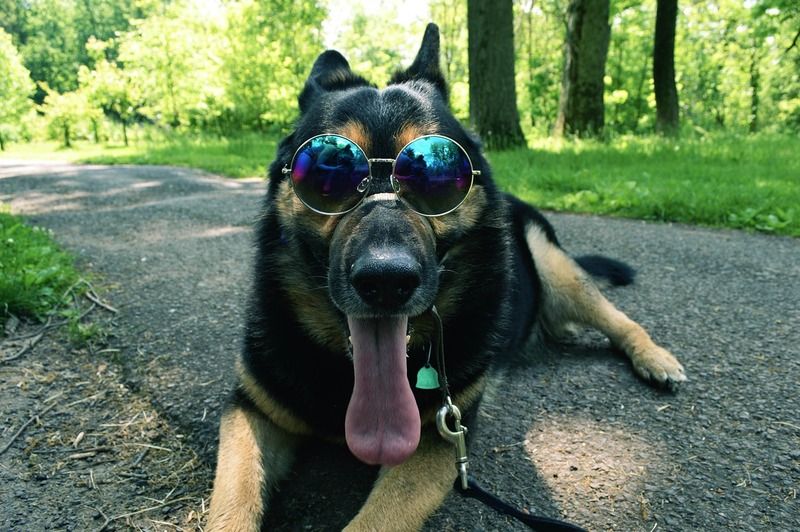 In this blog, we’re going to look at ways to keep your canine cool! Why are dogs so sensitive to heatstroke? Essentially, because they are arctic animals! Their ancestors were wolves, and well adapted to cold weather, but with limited ability to lose heat in hot weather. Their descendants may have thinner coats, but their ability to cool themselves is still poor, compared to us (human being basically a tropical species who need to wear clothes to protect us in the colder North!). In particular, it’s a dog’s inability to cool down by sweating that’s so important; when we get hot, we sweat all over, allowing the salty water to evaporate cools us very efficiently. Dogs have a few sweat glands on their paws, but that’s more or less it - and useless for cooling off. In the absence of sweating, dogs instead pant to cool down. This is less efficient, so they cool down more slowly, and also means they waste more water doing so - this means that dehydration occurs much more rapidly than in humans. Finally, any impairment of their respiratory system (e.g. narrowed nostrils or overlong soft palates - “normal” features in short-nosed breeds like Pugs or Bulldogs) will dramatically reduce their ability to pant, putting them at high risk of heat stroke. Typically, they start with excessive panting and drooling. As they become dehydrated, the drool becomes thicker and thicker, and they will be obviously distressed. In some cases, though, this can happen incredibly fast, and the first obvious sign is collapse. Often, the tongue will be swollen and discoloured, and seizures may occur. Without immediate treatment, death is almost inevitable. What should I do if my dog’s showing signs? Try to cool them off - offer them water, consider wetting them with luke-warm or cool water (try to avoid ice-water), do NOT put any blankets, towels or other insulating layers over them, and call us immediately. We will almost certainly need to see them to continue active cooling, rehydrate them and, if necessary, initiate intensive care procedures to minimise damage to their brain and internal organs. OK, so how do we avoid heatstroke? This is the important bit! In the current hot weather, we need to be extra careful, so here’s our Top Tips! Open the windows or turn on the fans to get a breeze going! A cool room will be a “safe space” for your dog to escape to. However, leave the curtains drawn if they’re in direct sunlight, or the room can become an oven. Invest in a cool blanket or coat - these aren’t great for treating heatstroke, but are excellent for preventing it! Make sure it doesn’t dry out though - it only works if its still wet. NEVER leave your dog (or any other pet, for that matter) in a conservatory or greenhouse - it’ll act like an oven. Hosepipes are also a great game for many dogs! In hot weather, try to avoid the heat of the day for walks - early morning or late evening is best. Missing a walk is better than heatstroke! If playing, make sure that your dog takes regular breaks - exercise will rapidly lead to a rise in temperature and massively increases the risk, especially as dogs often don’t realise that they’re overheating if they’re having fun. When out on walks, always take plenty of cool water and a bowl to rehydrate your companion - even in the evening as the ground and pavements take a long time to cool down. Swimming (in a safe place) is a great way for a dog to cool down and have fun, but don’t overdo it - exhaustion can easily lead to a drowning risk. In sweltering weather at home, try giving some cool treats - ice cubes in the water, frozen carrots or even frozen chew toys will all help keep things cool! Watch out for tarmac or concrete pavements - if they feel hot to the back of your hand, they can burn your dog’s pads. Pebbles and stones can also act like a griddle, so if in doubt, stick to the grass. Meanwhile, watch out for sunburn - apply a pet-safe sunscreen to hairless or scantily haired areas (ears, belly and nose), especially if your dog has pink skin. If you are worried about your dog in the heat, call us IMMEDIATELY.